After working for over six decades as a Syracuse Athletics usher, one of SU's most loyal fans reflects on life, cancer and Orange Pride. Update: On March 3, 2018, Harry Tzivani died at home at the age of 92. Following is a 2010 profile on the Syracuse Orange "superfan." Harry Tzivani suffered an injury during World War II that left him with chronic back pain. Twenty years ago, the government told him he could no longer take the medication they were providing to help with the pain. And to top it all off, he found out that he had cancer. And not just one type. Five. That man has gone to work for 62 years with all of those problems. 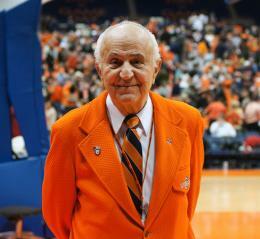 That man is a 20-year-old usher who has worked for Syracuse University athletics for more than six decades. Okay, he’s actually 85, though all evidence points to the contrary. Tzivani is a hard man to miss; just look courtside at an SU basketball game and you will see him in his bright orange jacket. He has been an integral part of Syracuse University athletics for so long that he has seen more history unfold at SU than most people could ever imagine. He has seen Jim Boeheim play for the Orangemen alongside Dave Bing. He saw Jim Brown, Ernie Davis and Floyd Little, the great No. 44s, take the field in the 1950s and '60s. He has seen Derrick Coleman, Carmelo Anthony, Gerry McNamara, Jonny Flynn and Hakim Warrick play basketball. Over the course of 62 years, Tzivani has been to approximately 2,000 basketball games alone, a number that most SU fans could never even fathom. But he never stopped to consider the scope of how many games he has actually seen. In fact, it left him in awe. He has ushered games at Manley Field House, Armory Square, and even the state fairgrounds. Now, he is a mainstay of Syracuse athletics. At work, Tzivani is responsible for accommodating photographers, checking credentials, and making sure ball boys are on task. He also caters to visiting teams should they have any needs while they are at the arena. On and off the court, Tzivani exudes pride in Syracuse University. Throughout his career at SU, he has met thousands of student-athletes, each of whom he cared for deeply. “I wanted to be a parent for a parent that wasn’t there for them,” Tzivani said. Tzivani has lived with pain for almost his entire life. When the Japanese came to retake Saipan in World War II, Tzivani was ordered to man a 40mm gun. As he did, a Japanese plane dropped a bomb that threw him into a bulkhead, causing chronic back and head pain for the reson of his life. From 1944 to 1989, he lived on morphine until the government took him off the medication. Then, in 1993, Tzivani discovered he had bone marrow cancer. As if one major malady was not enough, doctors have since discovered at least three other types of cancer in his body: lymphoma behind his eye, colon cancer and thyroid cancer. One month agao Tzivani had a CT scan which revealed that he has enlarged lymph nodes in his chest. He will soon visit a cancer center in Buffalo to undergo a PET scan to determine if the nodes are cancerous. But apparently five different types of cancer cannot stop Harry Tzivani. Tzivani owes that health to the storm of medication circulating in his body. What the rest of us call chemotherapy, Tzivani calls “goo-goo juice.” The treatments enable Tzivani to continue working and living his life the same way he always has: in service to the university and to others. When Syracuse hosts the Sweet Sixteen and Elite Eight in March, Tzivani will be there in his bright orange jacket, making sure the operation is running smoothly. He hopes that one day Syracuse will have the amenities to host a Final Four, but for now, he can simply have pride in a university that he has served for 62 years. Submitted by Jean DiNoto (not verified) on March 6, 2010 - 5:30pm. What an inspiring and uplifting story. SU should be proud to have him on their side. Keep up the good work! Submitted by Matthew Nojiri (not verified) on March 5, 2010 - 2:16pm. The orange pants/jacket combination should be a requirement for every SU Alum. Great story! Submitted by suzanne loucky (not verified) on March 4, 2010 - 3:11pm. Submitted by Michael Hersher (not verified) on March 4, 2010 - 1:58pm. Way to go Harry! Papou is the man and the 'Cuse is lucky to have him all these years. Submitted by John Anthis (not verified) on March 3, 2010 - 8:39pm. This is a well deserved and long overdue story. Harry should be put on a pedestal for what he has done in terms of volunteering his time to the university. Mr. Gross should take note and should do something to show how much the university appreciates what Harry has done over the past 62 years. What a kind and generous man! Submitted by Brenda Wrigley (not verified) on March 3, 2010 - 11:09am. What a terrific story! Well written, well edited and compelling. Nice job! Submitted by Joe Caezza (not verified) on March 2, 2010 - 8:07pm. This was a great story and Harry is a testament to good living and a paasion for what you do. thanks Harry for your service to the school and community.